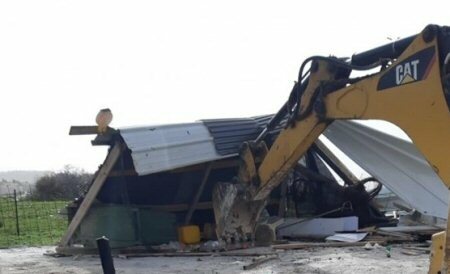 A Palestinian from the town of Umm al-Fahm, in northern Israel, was forced to demolish a steel structure used as a warehouse, on Saturday, upon receiving a demolition notice by Israeli authorities. Abdullah Jabbarin said that he received a demolition notice for his warehouse, pointing out that he would be forced to pay the cost of demolition and an additional fine if he does not carry out the demolition. He added that he had built this steel structure almost a year and a half ago, to store his farming equipment. Israel uses the pretext of building without a permit to carry out demolitions of Palestinian-owned homes on a regular basis, while the permit itself is rarely, if ever, granted.